I immediately suggested a quick stop in Sedona, since that’s on the way to Flagstaff and shouldn’t be missed. 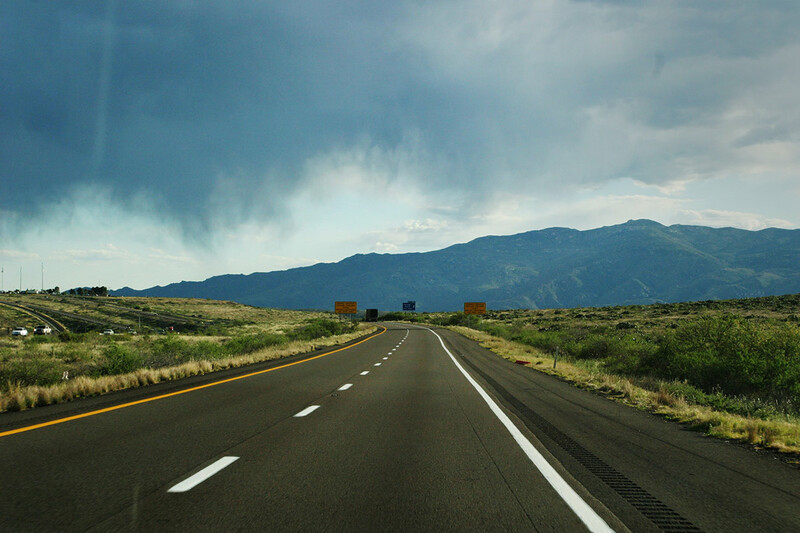 Here are a few ideas for your own drive to Flagstaff and what to see along the way. Stop #1: Coffee on the way out of town! One of our important stops is for coffee on the way out of town! 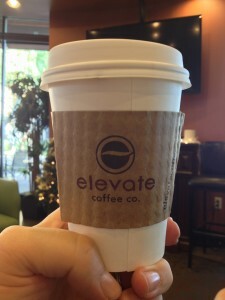 We nearly always go to Elevate Coffee just off of the I-17 on the way north. The exit is Happy Valley Road, and you’ll turn left (going East) and then after about a half mile turn left into the shopping center. The coffee shop is in the back left corner of the shopping center, by the Harkins Theatre. The coffee is delicious here, and we have stopped here multiple times on the way out of town. Montezuma Castle is an 800 year old cliff-dwelling located about 26 miles south of Sedona (and just off the I-17 which makes it an easy stop). 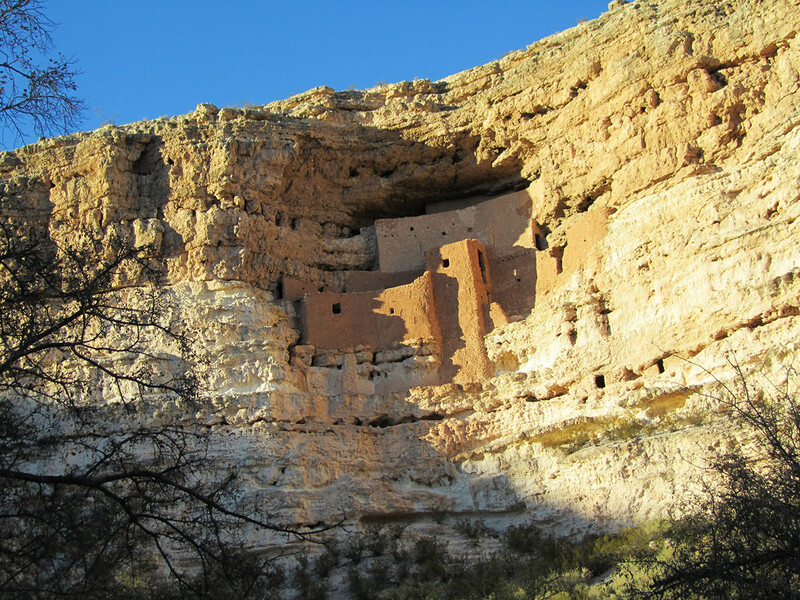 The cliff dwellings are one of the best-preserved in North America and comprise 20 rooms. To get there, take exit 289 from I-17. Drive east (through two traffic circles) for approximately 1/2 mile to the blinking red light, then turn left onto Montezuma Castle Road. Please note, there’s a Montezuma Well you can also see which is an entirely separate freeway exit about 11 miles away at freeway exit 293. Just outside of Sedona, in the town of Oak Creek, is a coffee shop called Firecreek Coffee Company. If you miss this shop, don’t worry because they have a locaton in Flagstaff as well. Stop #4: Red Rock Crossing. Read more about Red Rock Crossing. This is easily the most photographed place in Sedona. Plan for 2 hours here. With beautiful views of Cathedral Rock, this place is a great place to go for a picnic! Easy hiking area (a level hike of a mile or two). By far one of my families favorite hikes in Sedona (perhaps only topped by Oak Creek Canyon). Red Rock Crossing is where all of those lovely photos of Sedona’s red rocks are taken — the ones with water in the foreground, and beautiful red rocks in the background. The hike is also notable because it is mostly level, and runs along a creek (the runoff from Oak Creek, I presume). Stop #5: Lunch in Sedona. To be honest, there are so many awesome places to get lunch in Sedona, that I could never list them all. Some highlights would include Indian Gardens Cafe & Market where you can find excellent sandwiches, salads, and even espresso drinks. We also like visiting Firecreek Coffee in Sedona. Stop #6: Shopping in historic Sedona! There are lots and lots of shops on both sides of the freeway in Sedona. You’ll have a lot of fun strolling around, and checking out the shops which overlook beautiful red rocks. Check with Pink Jeep Tours for lots of great tour ideas. Don’t miss the Pink Jeep Tours patio where you can stop for coffee and sit on the enormous patio overlooking the red rocks. Sedona Main Street is a fun shopping area that you can’t miss because it’s directly in the heart of Sedona’s touristy area. 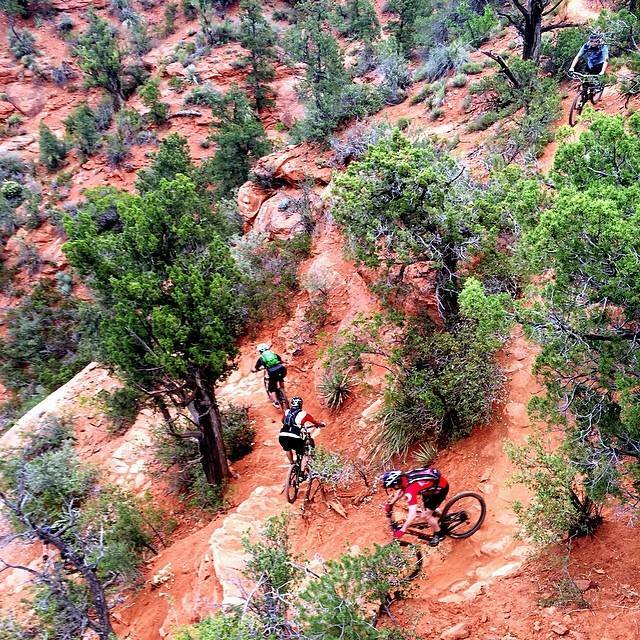 Dubbed “Uptown Sedona” by the locals, it’s definitely the main hub of activity. There are lots of clothing stores, and shops selling all kinds of trinkets, fine art, dining options, museums and hotels. A very pedestrian-friendly area. Stop #7: Oak Creek Canyon Hike: One of the most beautiful hikes in Arizona. The Oak Creek Canyon and especially the West Fork Trail is one of my favorite places to hike in all of Arizona. 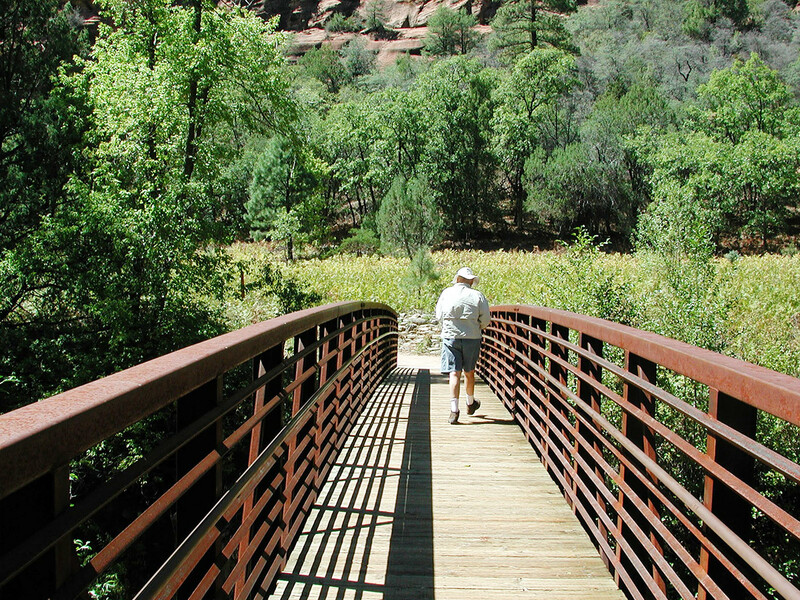 The beautiful Sedona canyon walls surround you on this hiking trail that follows a mountain stream. The dirt path crisscrosses the stream at multiple points. Some of my favorite childhood memories are from hiking here. There have been hikes in the summer when the stream was full of water, to the wintertime when the area is silent and covered with snow. The path goes back a considerable distance. We’ve hiked 7 miles back, but never any further. Parking is difficult, to say the least. Try the main parking lot first, and if you cannot find a parking space try to find a parking space along the main road. There are plenty of restrooms (or latrines) at the parking area, and the trails are well marked so you can’t get lost. Bonus sights along the hike: An old abandoned home made of rocks, a small cave built into the side of a rock next to some old abandoned stables. There’s also plenty of blackberries to pick, and a bridge that crosses a river. 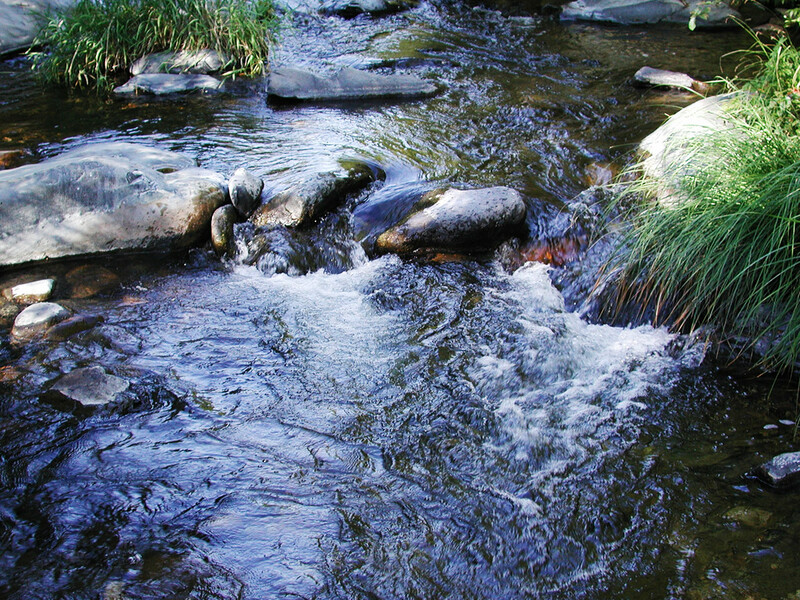 If it has been raining recently, the Oak Creek will be full of water. Schnebly Hill Road is a dirt road that takes about 30-40 minutes. Schnebly Hill Road is a dirt road you can take as you enter or exit Sedona. It meets up with the I-17. The Arizona Republic calls it one of the “premiere drives in Arizona,” and they’re absolutely right. The elevation change is 2,000 feet and the road is so rough, that you will want to take a high-clearance vehicle (or just take your shiny new Lexus)..
You can begin the drive from the top or bottom, but people recommend starting from the top as you’ll have a better view of the scenic Sedona valley. You’ll pass Oak, Juniper, and Pine trees. I’ve had friends take brand new cars on this drive, and get so nervous. Seriously, keep in mind it is a rough road. Plan for 45 minutes. 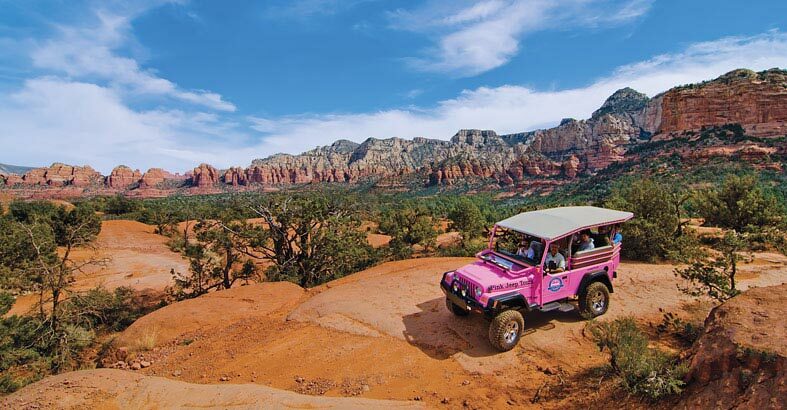 A Jeep tour from one of the many places in Sedona. The Jeep tours take you through some of the most beautiful and rugged scenery. There are a lot of horse ranches in the greater Sedona area. Horseback riding in Sedona is plenty of fun! There are great views of the red rocks and surrounding valley. Slide Rock State Park: One of America’s Top 10 Swimming Holes. 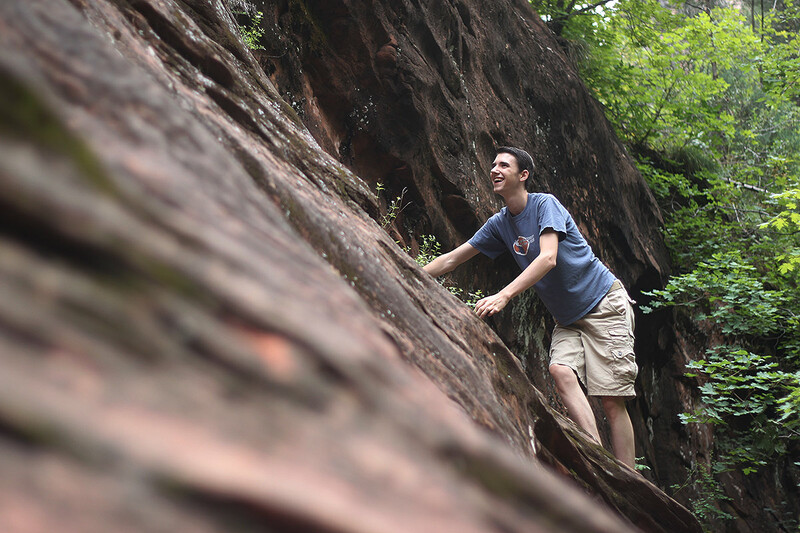 Check out Slide Rock for summertime fun! It has been named a top swimming hole and it’s a great place to cool off in Sedona. A 43-acre historic apple farm and a state park. More details are available here. 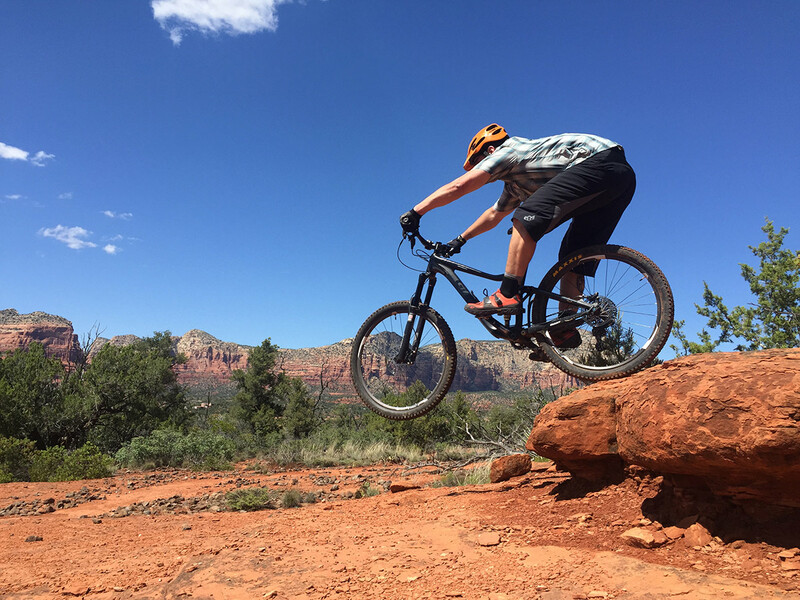 Bicycle riding is fun in Sedona. You can rent bikes at The Bike and Bean store in Oak Creek (a sweet bike shop with a coffee shop built in that is located at 75 Bell Rock Plaza). Bike and Bean offers pricing starting at $30 for a 2 hour rental ($20 for kids bikes). You can access the entire biking trail system from Bike and Bean’s location. Everything connects here, all 275 miles. There are several days of riding, right around the shop. It’s really all about the trails and how amazing they are. The bonus is always the views but each trail has its unique views and features. When you stop in, ask them for advice on a good trail. 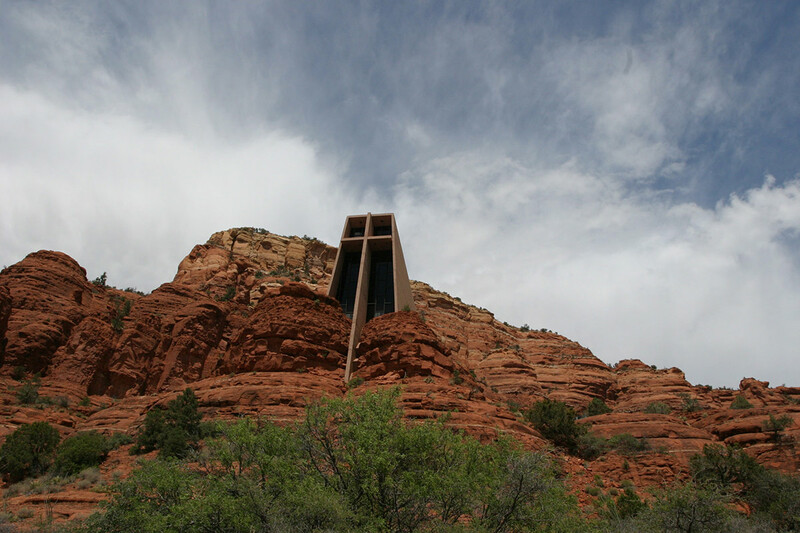 Visit the Chapel of the Holy Cross, a Roman Catholic church built into the side of a mountain. Besides the beautiful views, there’s not much happening here besides a Monday prayer service. They don’t hold services or weddings here. Tlaquepaque Village (pronounced Talah-keh-pah-keh), is pretty cool to walk around, but it is a lot of overpriced shopping (cats, art, sculptures, dinnerware, etc.). Some good restaurants, and a sweet place to walk around. 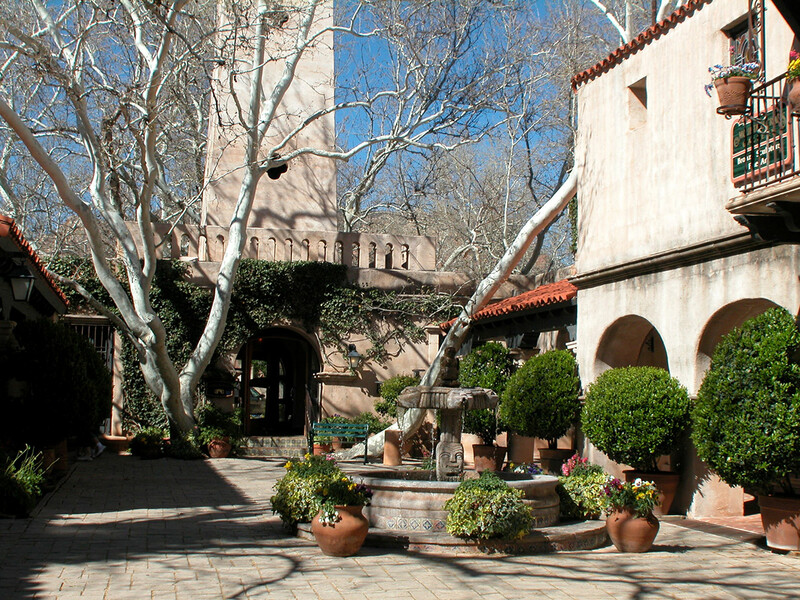 Tlaquepaque has beautiful architecture that’s designed to look like an authentic traditional Mexican village. Stop #8: Drive north to meet up with the I-17. Exit Sedona via 89A and you join up to the I-17 going northbound so you don’t have to go all the way back. 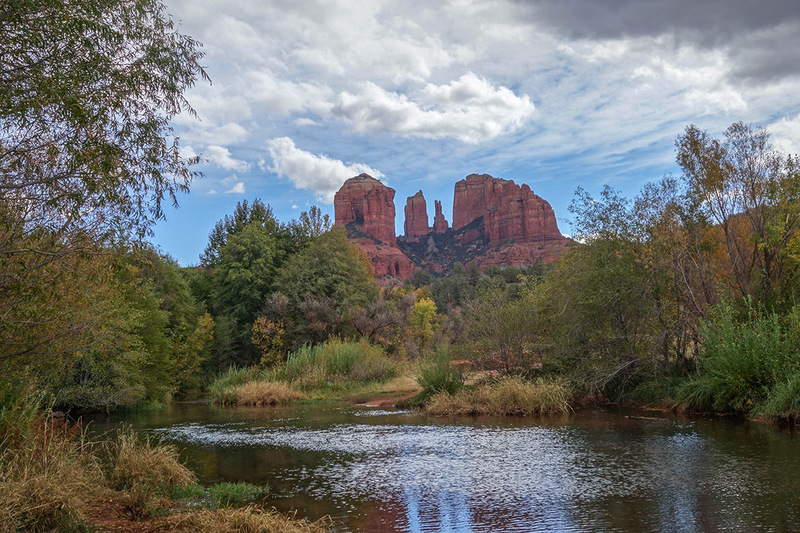 Continue up the road and leave the Oak Creek Canyon area by driving up the zigzag portion of the highway. The road winds back and forth until you will emerge in an old pine forest that meets up with the I-17 freeway. This is one of my favorite winding roads in Arizona. 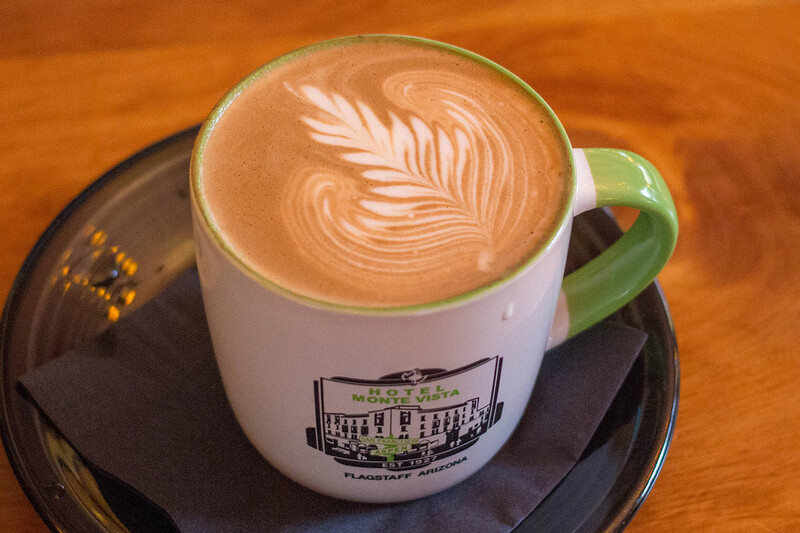 Head to downtown Flagstaff for dinner or more coffee at Firecreek Coffee Company. 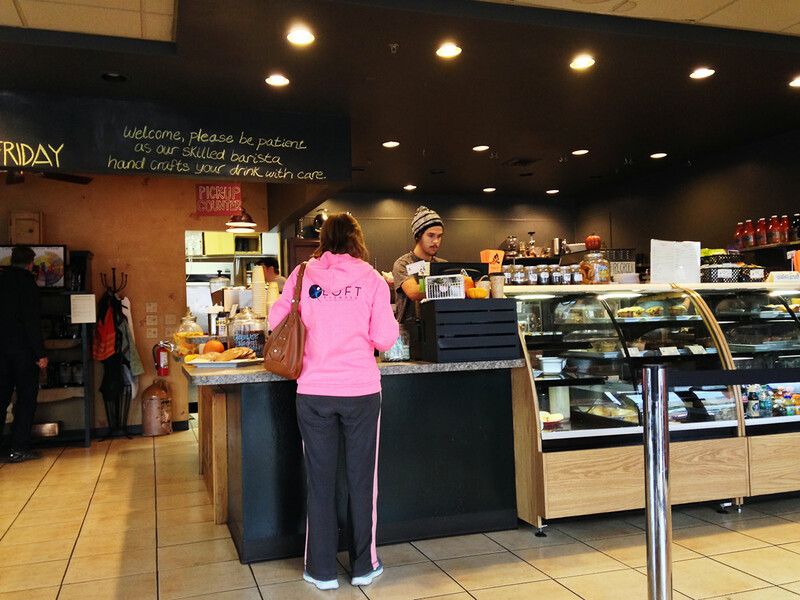 The Flagstaff location of Firecreek Coffee is the flagship store for this company, and it is much larger than the companies shop in Sedona. We also highly, highly recommend stopping at Rendezvous Cafe for a coffee (they also serve beer, wine, and alcohol!). This cafe is in the base of the Hotel Monte Vista located in the heart of Flagstaff and it is one of our favorite places to grab drinks. We stopped there after a cold trip up to the top of the mountain at Arizona Snowbowl. 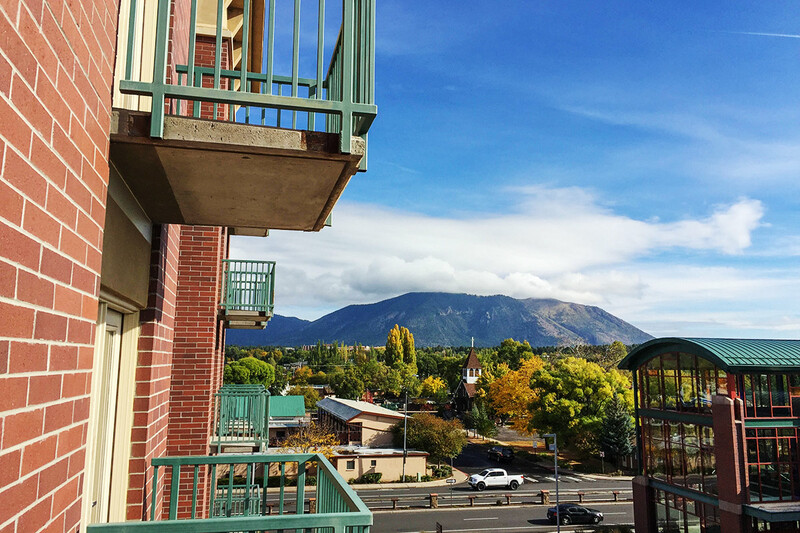 If you’re looking for lodging, we recommend the Drury Inn & Suites in Flagstaff. Really nice people, and they have a heated swimming pool that is indoors. Also, Drury Inn & Suites has free drinks and appetizers every night! If you are looking for something cozy, look on Airbnb for places around Flagstaff. You can also find cabins in the area. Take I-17 (Black Canyon Freeway) north to Exit 298/ AZ179 toward Sedona/Oak Creek Canyon. Then, take Highway 89 into Sedona. 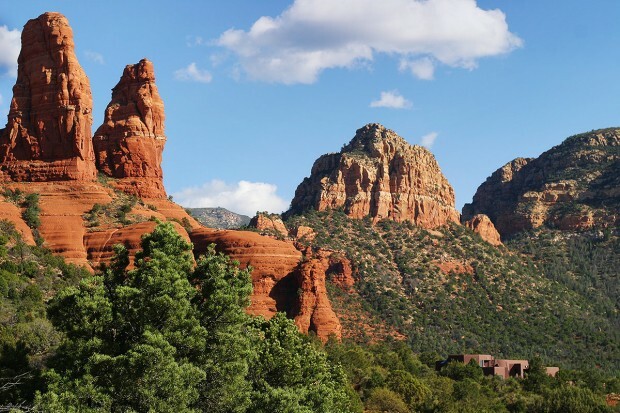 Sedona has wonderful hiking and restaurants. My favorite is Creekside for breakfast or the most amazing tacos in the world at Sedona Airport. No, I’m not exaggerating about the tacos. I like Airport Shuttle of Phoenix and Sedona Shuttle for actually getting there. Non-Stop and much less than a taxi. You get to see a lot more when you don’t drive and they’re very knowledgeable about the area.